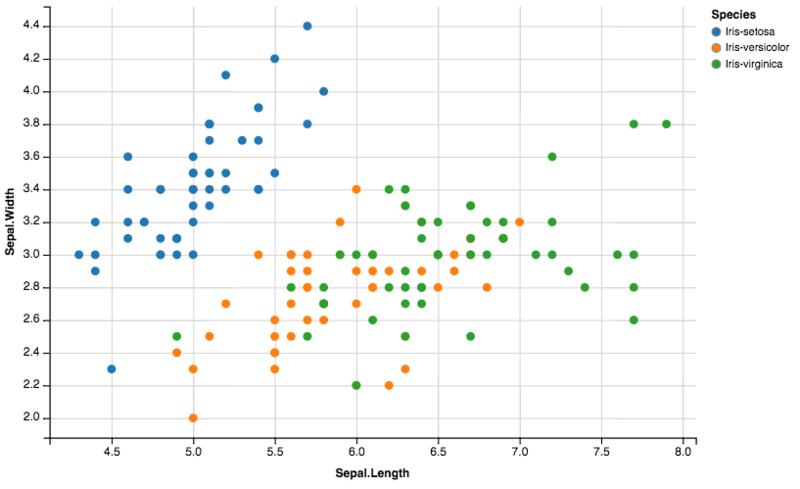 Machine learning is a branch in computer science that studies the design of algorithms that can learn. Typical machine learning tasks are concept learning, function learning or “predictive modeling”, clustering and finding predictive patterns. These tasks are learned through available data that were observed through experiences or instructions, for example. Machine learning hopes that including the experience into its tasks will eventually improve the learning. The ultimate goal is to improve the learning in such a way that it becomes automatic, so that humans like ourselves don’t need to interfere any more. This small tutorial is meant to introduce you to the basics of machine learning in R: more specifically, it will show you how to use R to work with the well-known machine learning algorithm called “KNN” or k-nearest neighbors. If you’re interested in following a course, consider checking out our Introduction to Machine Learning with R or DataCamp’s Unsupervised Learning in R course! Machine learning usually starts from observed data. You can take your own data set or browse through other sources to find one. Tip: don’t only check out the data folder of the Iris data set, but also take a look at the data description page! The command reads the .csv or “Comma Separated Value” file from the website. The header argument has been put to FALSE, which means that the Iris data set from this source does not give you the attribute names of the data. Instead of the attribute names, you might see strange column names such as “V1” or “V2” when you inspect the iris attribute with a function such as head(). Those are set at random. To simplify working with the data set, it is a good idea to make the column names yourself: you can do this through the function names(), which gets or sets the names of an object. Concatenate the names of the attributes as you would like them to appear. In the code chunk above, you’ll have listed Sepal.Length, Sepal.Width, Petal.Length, Petal.Width and Species. Once again, these names don’t come out of the blue: take a look at the description of the data set that is linked above; You’ll normally see all these names listed. First, you can already try to get an idea of your data by making some graphs, such as histograms or boxplots. In this case, however, scatter plots can give you a great idea of what you’re dealing with: it can be interesting to see how much one variable is affected by another. 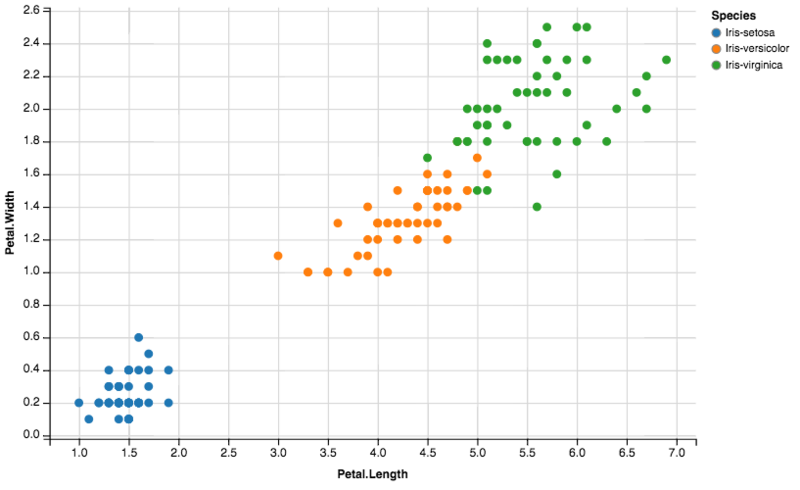 You see that there is a high correlation between the sepal length and the sepal width of the Setosa iris flowers, while the correlation is somewhat less high for the Virginica and Versicolor flowers: the data points are more spread out over the graph and don’t form a cluster like you can see in the case of the Setosa flowers. However, as you will see from the result of this command, this really isn’t the best way to inspect your data set thoroughly: the data set takes up a lot of space in the console, which will impede you from forming a clear idea about your data. It is therefore a better idea to inspect the data set by executing head(iris) or str(iris). Remember the nerd tip: if you’re not sure if you have this package, you can run the following command to find out! After exploring your data and preparing your workspace, you can finally focus back on the task ahead: making a machine learning model. However, before you can do this, it’s important to also prepare your data. The following section will outline two ways in which you can do this: by normalizing your data (if necessary) and by splitting your data in training and testing sets. For example, if your dataset has just two attributes, X and Y, and X has values that range from 1 to 1000, while Y has values that only go from 1 to 100, then Y’s influence on the distance function will usually be overpowered by X’s influence. The Iris data set doesn’t need to be normalized: the Sepal.Length attribute has values that go from 4.3 to 7.9 and Sepal.Width contains values from 2 to 4.4, while Petal.Length’s values range from 1 to 6.9 and Petal.Width goes from 0.1 to 2.5. All values of all attributes are contained within the range of 0.1 and 7.9, which you can consider acceptable. Nevertheless, it’s still a good idea to study normalization and its effect, especially if you’re new to machine learning. You can perform feature normalization, for example, by first making your own normalize() function. Test this in the DataCamp Light chunk below! In order to assess your model’s performance later, you will need to divide the data set into two parts: a training set and a test set. One last look on the data set teaches you that if you performed the division of both sets on the data set as is, you would get a training class with all species of “Setosa” and “Versicolor”, but none of “Virginica”. The model would therefore classify all unknown instances as either “Setosa” or “Versicolor”, as it would not be aware of the presence of a third species of flowers in the data. You thus need to make sure that all three classes of species are present in the training model. What’s more, the amount of instances of all three species needs to be more or less equal so that you do not favour one or the other class in your predictions. To make your training and test sets, you first set a seed. This is a number of R’s random number generator. The major advantage of setting a seed is that you can get the same sequence of random numbers whenever you supply the same seed in the random number generator. Note that the replace argument is set to TRUE: this means that you assign a 1 or a 2 to a certain row and then reset the vector of 2 to its original state. 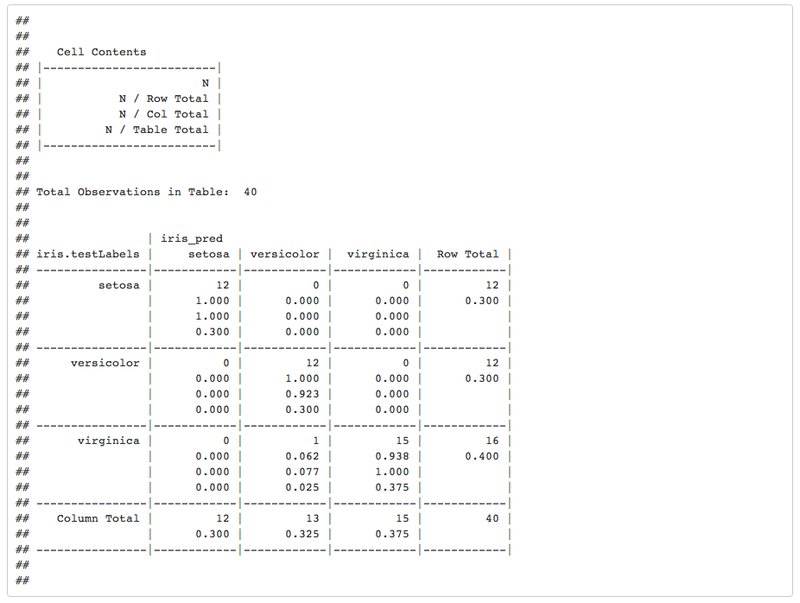 This means that, for the next rows in your data set, you can either assign a 1 or a 2, each time again. The probability of choosing a 1 or a 2 should not be proportional to the weights amongst the remaining items, so you specify probability weights. Note also that, even though you don’t see it in the DataCamp Light chunk, the seed has still been set to 1234. Remember that you want your training set to be 2/3 of your original data set: that is why you assign “1” with a probability of 0.67 and the “2”s with a probability of 0.33 to the 150 sample rows. Note that, in addition to the 2/3 and 1/3 proportions specified above, you don’t take into account all attributes to form the training and test sets. Specifically, you only take Sepal.Length, Sepal.Width, Petal.Length and Petal.Width. This is because you actually want to predict the fifth attribute, Species: it is your target variable. However, you do want to include it into the KNN algorithm, otherwise there will never be any prediction for it. Note that you don’t want to insert the test labels: these will be used to see if your model is good at predicting the actual classes of your instances! You see that when you inspect the the result, iris_pred, you’ll get back the factor vector with the predicted classes for each row of the test data. An essential next step in machine learning is the evaluation of your model’s performance. In other words, you want to analyze the degree of correctness of the model’s predictions. You see that the model makes reasonably accurate predictions, with the exception of one wrong classification in row 29, where “Versicolor” was predicted while the test label is “Virginica”. From this table, you can derive the number of correct and incorrect predictions: one instance from the testing set was labeled Versicolor by the model, while it was actually a flower of species Virginica. You can see this in the first row of the “Virginica” species in the iris.testLabels column. In all other cases, correct predictions were made. You can conclude that the model’s performance is good enough and that you don’t need to improve the model! In the previous sections, you have gotten started with supervised learning in R via the KNN algorithm. As you might not have seen above, machine learning in R can get really complex, as there are various algorithms with various syntax, different parameters, etc. Maybe you’ll agree with me when I say that remembering the different package names for each algorithm can get quite difficult or that applying the syntax for each specific algorithm is just too much. That’s where the caret package can come in handy: it’s short for “Classification and Regression Training” and offers everything you need to know to solve supervised machine learning problems: it provides a uniform interface to a ton of machine learning algorithms. If you’re a bit familiar with Python machine learning, you might see similarities with scikit-learn! In the following, you’ll go through the steps as they have been outlined above, but this time, you’ll make use of caret to classify your data. Note that you have already done a lot of work if you’ve followed the steps as they were outlined above: you already have a hold on your data, you have explored it, prepared your workspace, etc. Now it’s time to preprocess your data with caret! As you have done before, you can study the effect of the normalization, but you’ll see this later on in the tutorial. You already know what’s next! Let’s split up the data in a training and test set. In this case, though, you handle things a little bit differently: you split up the data based on the labels that you find in iris$Species. Also, the ratio is in this case set at 75-25 for the training and test sets. Congratulations! You’ve made it through this tutorial! This tutorial was primarily concerned with performing basic machine learning algorithm KNN with the help of R. The Iris data set that was used was small and overviewable; Not only did you see how you can perform all of the steps by yourself, but you’ve also seen how you can easily make use of a uniform interface, such as the one that caret offers, to spark your machine learning.